This outing brings us Raoul Silva (Javier Bardem), a cyberterrorist with a vendetta against MI6. Bond must stop him with the aid of another MI6 agent, Eve (Naomi Harris), and the new Q (Ben Whishaw), appearing for the first time since Craig joined the franchise. On the home front, Bond and M must also contend with Gareth Mallory (Ralph Fiennes), M’s new boss and a bureaucrat looking into the shadows of their world. The plot to Skyfall is more straightforward than the few previous Bond films, and while it isn’t far off from places the series has gone before, it succeeds because it puts character relationships front and center. The biggest evolution the franchise has made since Craig took over the role is allowing for Bond’s character development. This is an aging Bond, a Bond who is hurt, sometimes vulnerable, but all of it is concealed under the tough exterior that we as an audience find so beguiling. Bardem’s Silva is a similar creature to Craig’s Bond, but Silva’s pain is worn as conspiciously as his bleached blonde locks. Because of this, and his past connections to Bond and M, Silva is one of the best villains in the franchise. His character is a rather blatant homage to Heath Ledger’s Joker, but in no way does that hinder the freshness he brings to the world of Bond. Bardem is exceptional in the role, using just the right amount of offbeat quirks and charisma to offset the broiling menace he exudes. What makes Skyfall such an enjoyable roller coaster is the combination of these complex character relationships. This may be the first Bond film to be an emotional ride in addition to being a thriller. The quality of the filmmaking on display here also continues to elevate the franchise, much like Christopher Nolan’s Dark Knight. Director Sam Mendes brings moody style, as seen in Road to Perdition, and Skyfall also taps into Mendes’ common theme of family in a way that is unique for the series. It asks questions about betrayal, loyalty, and protection, and doesn’t stop to provide a clear answer. Mendes also does not shy away from action, and the “opening gambit” scene through Istanbul is the best single action sequence so far this year. While the film is never able to top that on sheer spectacle, other action sequences demonstrate just how real the stakes are, and how perilously close our heroes are to losing everything dear to them. While there are nods to previous films, and a lot more humor than the last two installments, Skyfall is still more in line with the seriousness of the Craig films. Rather than the winking wit of the classic entries, a lot of the humor is based on acknowledging both the age of the franchise and Daniel Craig’s weathered 44 years. Skyfall also takes the bold step of adding to some of the mythology of Bond for the first time in recent memory, a welcome exploration and a credit to the talents of everyone involved. The film is also very tense and well-paced, barely feeling it’s almost two and a half hour running time. Fans of the franchise will be quite proud of Skyfall, and there is much to enjoy for the casual moviegoer as well. Adele’s ‘Skyfall’ theme and the accompanying title sequence is gorgeous, and perfectly sets the tone for this most unusual departure. This film is a prime example of how much an older franchise with so much cultural history can benefit by bringing in an auteur director. 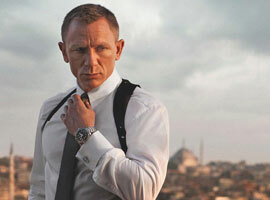 Skyfall is now playing in Philly-area theaters. This is one of the best Bond movies I have ever seen. The story is superbly put together and has some interesting twists, the action is well done and contains none of the shaky cam which plagued the last film. The actors all do a great job. Some might still be put off by Daniel Craig’s rough version of Bond, but I like it and he even has a few good old fashioned one-liners here. I wasn’t sure about Javier Bardem as the villain at first. I thought he was a tad too flamboyant but eventually he grew on me, plus he had a very interesting backstory and as you might have guessed already, Judi Dench is fantastic as usual as M and she even has more to do in the story this time arround. This is not a completely formulaic Bond movie. Craig’s bond is still more emotional than Connery or Moore ever were and for the first time we get some relatively detailed descriptions of his childhood. And something happens to Bond in the start of the movie that affects him for the rest of the film. But despite all that there are tons of James Bond trademarks like the martini, the introduction and even Q. Some might not like this new very young version of Q but I found him to be funny and very likable. They will never top Desmond Llewelyn’s original performance, and instead of making a cheap Llewelyn clone, they make a completely different character which I think is the only right thing to do. This is not only a great Bond movie but just a downright great film.